There was once a time, long before we’d ever heard of “free-to-play,” when MechWarrior was one of the flagship simulator franchises. Men and women across the world piloted immense walking tanks with the aid of joysticks, throttles, and flight pedals. The genre died in the early 2000s and laid dormant for nearly a full decade before the next entry in the venerable MechWarrior franchise brought the series squarely into the modern era. Piranha Games’ latest entry in the series dispenses with any single-player campaign in favor of a free-to-play multiplayer shooter. After nearly a year in open beta, Piranha have announced that they are officially “launching” MechWarrior Online with the patch released on September 17, 2013. 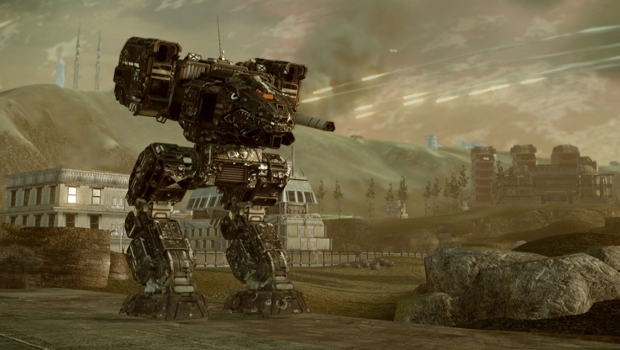 I was a bit unfair earlier—calling MechWarrior Online a “shooter” is selling it a bit short. Anybody who tries to play it like Call of Duty is in for a nasty surprise when they realize just how hard it is to score a kill. Even the smallest Spider or Raven will take a concerted effort to bring down. Meanwhile, the exposed attacker will come under withering fire from the smaller ‘Mech’s allies. While one ‘Mech will have a hard time destroying another, four or five ‘Mechs can reduce an exposed enemy to a scrapheap in seconds. Oh, and once you’re down, you’re out—there are no respawns—so it behooves you to use your brain instead of running out into the open. [singlepic id=16314 w=320 h=240 float=left]Pilots fresh into their ‘Mech will have to get used to the series’ unique motion. A ‘Mech’s legs and torso move independently, and this will lead newer pilots astray, but after a few rounds the whole concept starts to feel much more natural. Once you get past that hurdle, it’s really easy to sink into your ‘Mech’s cockpit. Once you get in the groove, ‘Mech combat feels great. Lasers heat ‘Mech armor until it glows, missiles arc down onto their targets and ballistic projectiles clang off your armor, shaking the whole cockpit. The whole experience is exhilarating, especially with headphones. If maps feel a bit crowded in MechWarrior Online, that’s because they are. A recent patch upped the number of players on each team from 8 to 12, and that means that there’s very little room for one team to out-maneuver the other. Not that you’d need to—the name of the game in MechWarrior Online is “concentration of force.” Most matches devolve into a slugging match between the heaviest ‘Mechs on each team with the lightweights skirmishing on the fringes. That’s not to say that the smaller ‘Mechs aren’t valuable—effective scouting by Light ‘Mechs can expose entrenched positions, calling a hail of missiles down on the supposedly protected enemies. It wouldn’t be MechWarrior without the ability to modify and optimize your ‘Mechs, and MechWarrior Online doesn’t disappoint—the MechLab gives you plenty of control over your ‘Mech’s loadout. ‘Mech creation is an art of balancing firepower, mobility, armor, and heat dissipation. Want to add that Gauss Rifle? Better shave off a few points of armor. Need to get to the fight sooner? Drop a bigger engine in there—but it’ll cost you firepower. Engineering a new ‘Mech is fun, and it’s always nice to get your favorite vehicle into the fight. The MechLab’s UI could use a bit of help, though. While it’s nice to see different weapons actually alter your ‘Mech’s model—you can sometimes determine a ‘Mechs loadout by simply looking at it—the weapons and components themselves could use some explanation. Most guns are fairly straighforward, but Piranha could stand to explain the use of C.A.S.E. and NARC beacons to players unfamiliar with MechWarrior and Battletech. The ‘Mechs themselves are fantastic. There are about 20 different chassis types, each with several different configurations—i.e. a Raven 3L has a different weapons loadout than a Raven 4X. What’s neat is that each separate chassis feels unique. Some have more open cockpits giving you a better view of the battlefield. Others have low-slung weapons that preclude shooting over a ridge. The level of detail that goes into each new ‘Mech is awesome—it’s just a shame that it’s so hard to get new ones. [singlepic id=16313 w=320 h=240 float=left]Combat in MechWarrior Online is a lot of fun, and it’s even more of a shame that there’s so little to do outside of that. This title has essentially zero metagame. There’s very little to compel a player to keep at it except the allure of new ‘Mech chassis and paint schemes—and those don’t come cheap. If you want to pay cash, a new ‘Mech will run you between $10 and $25! A truly dedicated player might be able to save enough C-bills—the in-game currency—to get a new chassis, but they accrue very slowly. There is a lot of grinding to be done in MechWarrior Online, and the payoff might not be worth it. Piranha has long promised that “community warfare” will address this lack of endgame, but that feature has been delayed so often that it’s hard to be sure if it’s ever coming out. It’s a bit of a shame that there’s so little reason to keep at MechWarrior Online. The matches themselves are fun–and as it is free-to-play, there’s no barrier to entry–but without any form of metagame it’s hard to stay engaged.